What if the accident injuries don’t show up right away? Car accidents can happen anytime and they are always traumatizing. There will always be injuries involved in an impact between two vehicles. 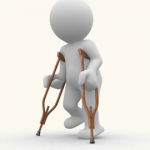 However, sometimes, these injuries will only show later on long after the accident is over. If you still want to file charges for the injuries you have incurred, you can consult or hire an attorney to represent you. There are a number of reasons why your injuries showed up in a later stage, and this can be used by your lawyer in court. When your body gets to an exciting experience, not necessarily in a fun sense, it produces extra adrenaline and endorphins to increase your energy level, strengthening your body, and even blocking the pain. This is the same thing that happens when you get into a car accident. You experience adrenaline rush and you will only feel the injury after the accident is over. Ligaments, tendons, and muscles are considered as “soft tissues.” Injuries in soft tissues do not show up immediately. It takes days or weeks before it manifests. The most common soft tissue injury in car accidents is the “whiplash,” where the neck muscles get injured due to the sudden tilting of your head forward as the car stops. Your brain is protected by your skull, however, during a car accident impact, your brain might hit the inner portion of your skull. This will result to a concussion. Concussion symptoms do not show up immediately. Some of the symptoms include clouded thinking, forgetfulness, loss of concentration, blurry vision, nausea, dizziness, abnormal sleep patterns, and lack of energy. After a car accident, it is best to see your doctor right away. If you found out that you have incurred injuries, then consult and hire an attorney to help you file the appropriate charges.